One of the best UF series out there and yet I still haven't started Magic Bleeds. :( I've got a bunch of books I really need to get to first. Must read faster! I second to that Leslie!!! YES! I loved this book. I'm so looking forward to how everything plays out for the rest of the series. I love Kate! I think she's fantastic. Natalie, this is an A series for me! I hope you enjoy it. Kate is just the best and well... Curran is not bad either, lol! Mariana. Yes, yes, yes! I can't wait to see what happens next. The wait it was left off leaves lots of things open and well... so many possibilities. Fantastic! You've hit the nail right on with "There's absolutely no waste to this book." 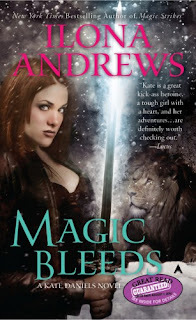 I love, love, love this series too and am in love with Kate and Curran. I am so amazed by much happened in this one book. Love all the friendships and romance...aaah, such a long way to go until the next book! It seems I have another UF series to try out. I just started the Patricia Briggs Mercy Thompson series and love it, so I can see me looking for this one asap as well. Hilcia, I LOOOOOVE your review and have no doubts that I'm going to feel the same way as you about this story when I read it. Every time I read a book from this series I say it's my favorite UF series... and then I read the next Mercy Thompson book and say THAT's my favorite UF series... and I go back and forth all year long. LOL.